Benjamin was taking forever to fall asleep tonight. It took me about as long to figure out what song he was singing to himself in his room (and then later in my room because he insisted, "Me seep mommy 'oom"). I'm certain that he picked it up in nursery at church (because I don't think I've sung it in a while). And he's completely adorable singing it. I don't usually sing "chomp" when I sing this song (I usually sing "snap") but it sounded like Benjamin was saying chomp so that's the way I said it (because I was hoping he'd just say it himself). Yesterday was Miriam's first official day of preschool. Since Benjamin and I had joined her for the open house she hadn't realized that I wouldn't be coming inside with her and instead would just be dropping her off. "What? What?" she sputtered when I told her that she was supposed to practice her independence—getting out of the van on her own, going inside the preschool by herself, taking off her shoes, hanging up her book bag, and so on. "You're not coming with me?!" "Nope. I'm just dropping you off. Is that okay?" I asked. "Okay?" she said. "That's awesome!" So apparently she's more than ready for some independence. So, I'm still stressing out about Benjamin growing properly. Today while Miriam was at preschool I looked up all the stats I have for him to see if he was ever in the 25th percentile and all my records show that he's just always been small. I even called the clinic today to check his records. This flagged my doctor so she called me back (I hadn't intended to bug her at all, I promise) to explain that the 25th percent figure came from his adjusted chart. And now he's sitting at the 5th percentile and she's not happy about it. How do I explain to my doctor that my child is healthy? Rachel weighed 26 lbs. at two years (she's always been my middle-ground child), so we'll leave her out of this discussion. But Miriam only weighed 23 lbs. at two years. Benjamin also weighed in at 23 lbs. at his two-year check up. But I guess 23 lbs is within the 5–10% range for girls and is below the 5th percentile for boys. That doesn't change the fact that Miriam was 15 lbs at 4 months old—putting her between the 50th and 75th percentile—and that she dropped down to the 5–10th percentile by the time she was two. Benjamin was apparently all the way up in the 25th percentile for his adjusted chart at 4 months (when he weighed 12 lbs). But his percentile has dropped quite a bit (like below the 5th percentile). How is it that Miriam's doctor concluded that she was a healthy breast-fed baby ("Must've been making some creamy milk right around then!" he quipped) and Benjamin's doctor seems about ready to diagnose him with failure to thrive? The World Health Organization seems to feel that breast-fed babies' weight gain does taper off around six months. They start growing slower than their formula-fed peers (whereas before that time they can grow faster). I have a feeling my doctor is using the CDC charts, since that's the norm here. Should I ask her to check him on the WHO charts? I can't seem to find a WHO chart adjusted for prematurity...and I'm not exactly sure how to adjust for prematurity myself. Do I just take x-number of weeks off his age when I plot him on the chart (where x=the number of weeks premature)? Also, I thought that premature babies were supposed to "catch up" to their peers by around two years. Benjamin is caught up developmentally, I think. His doctor wasn't at all concerned that the boy didn't even begin babbling until he was eighteen months old (I was concerned), but now he's a talking, running, jumping, happy little boy. He's just small. But I thought we allowed premature babies to be smallish. I was told in the hospital that he should catch up to their peers and "land on the regular growth chart by two years of age." Benjamin did that. He's on the chart. So why is my doctor freaking out? Is it because he's not as "chunky" as he was when he was four months old? Because all of my children chunked out at four-months old...and then their growth tapered off. Seriously, when my doctor weighed Miriam at her four-month check up he actually did it twice because he didn't think it was possible for her to have gained that much weight—but she had. And then she started tapering off. No one expected her to stay in the 75th percentile. I guess I'll just keep feeding Benjamin (because I was totally considering quitting that habit before...not) until I take him in for his weight-gain check in four months. For lunch to day he had a whole container of yogurt (perhaps with a couple tablespoons of sour cream mixed in), a banana, and a plate left-over noodles with melted cheese. Oh, and half a gingerbread man cookie that Miriam shared with him when we picked her up from preschool. And he had a bowl of graham crackers just before we left to pick her up. "That's not going to happen," I told him. "If you think I can drive to Duke twice in one day and still be happy person at the end of the day when I have to put the kids to bed on my own, you are mistaken." "Then how is it going to happen?" he asked. "We'll go to campus a little later and the kids and I will visit Duke Gardens while you're teaching," I said. He'd hoped to "get some stuff done" before teaching his class, but I think everything worked out fine in the end. He dropped Rachel off at school and ran to Kroger to get some last-minute groceries and some supplies for his class (he needed thirty erasers or something ridiculous like that and we simply didn't have that many erasers on hand), then he came home and packed while I got the little ones ready to go for the day. We packed a little picnic and were in the car, ready to go, by 9:43 (our goal was 9:45 so we felt pretty smug about this). We parked the car and Andrew gave me instructions on how to drive from the parking lot to the Sanford building so that I could pick him up when the time came, then we took a "short cut" through campus to visit his office. This was my first time seeing his office and my visit marks an end to a long-standing joke that perhaps he's not even going to school—because I've never actually seen his office. He's taken the girls to his office a couple of times when I've had meetings. But I'd never seen his supposed workspace. (Truthfully, it's not a very funny joke because it always made me think of this). Right now he's teaching some microeconomics classes to a group of Chinese bureaucrats for the DCID. He kept talking about the DCID last night and I kept smiling and nodding as if what he was saying made sense to me. Then I said, "So, what's the DCID?" "What't he DCID?!" he said. "You don't know what that stands for? I've been standing here going on and on about them and you don't even know what they are?!" "The Duke Center for International Development," he said. "Could have been anything," I pointed out. "How am I supposed to know who you're working for? I haven't even seen your office." I put air quotations around the word "office" to prove my point. But now I have seen his office so I guess he really does do stuff on campus (go figure). Now that he's a big third-year student he has a little cubicle with a door and everything. His old "office" was only a desk—no door. He's certainly moving up in the world. Benjamin was pretty sure that Daddy's office was the potty. When we pulled up to the door and Andrew unlocked it and swung it open, Benjamin said, "Potty!" and climbed out of the stroller. "That's not the potty," I said. "That's Daddy's office." "Do you need to go to the bathroom?" I asked. "Ummmmm..." said Benjamin, who likes to take a minute to think before answer any question. "Yes!" "Let's go find the potty," Andrew said. We left Andrew's cubicle behind in order to find both the potty and the pencil sharpener. Along the way Benjamin told everyone he saw, "Me—POTTY!" Andrew took Benjamin potty and then Miriam and I sharpened some pencils for him while he cut some paper for his class. We sharpened three whole pencils (out of, like, thirty) before leaving for Duke Gardens. 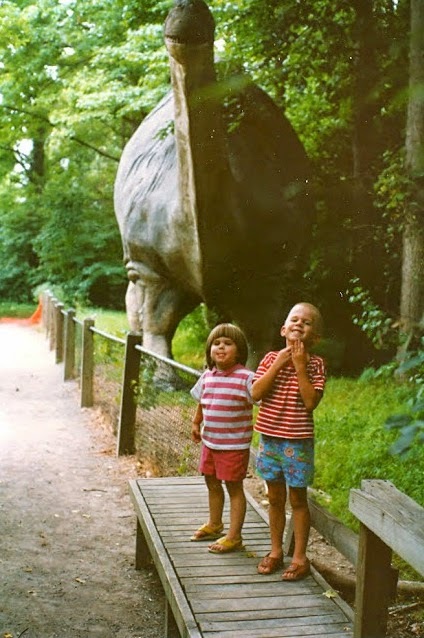 I mostly just let the kids do whatever they wanted while I followed them around. Benjamin's at a great age where he mostly wants to do whatever his sisters decide so he wasn't interested in straying too far away from Miriam in case she did something cool that he wanted to copy. This stage is much easier than the stage where he was always taking off in the opposite direction from everybody else! It didn't rain today so we were finally able to check out Wescott's Bronto Trail for family home evening. We've had several dinner conversations about matter and particles and how elements combine to form certain chemicals and so forth. It's been fun! At dinner a few nights ago Rachel fell off the bench—something our family has managed to avoid for quite a long time (don't cry when you see how little my kids were two years ago). She managed to catch herself, which was impressive considering how quickly she fell. Still, she started making terrible noises. At first we thought she was crying but really it was only uncontrollable laughter. "I was just putting my arm down to lean on it," she gasped out between peals of laughter. "But I didn't know how close I was to the edge of the bench! I thought I would put my hand down on a solid, but I put it down on gas instead!" With that you'd better believe Andrew and I cracked up, too. Those pesky gas particles, flowing freely wherever they may! *Just thought I'd clarify that this is not a frowny face. It's really just a parenthesis followed by a colon (followed by an asterisk). Tomorrow Rachel will be giving a talk in primary. It's possible we didn't remember to write this talk until after the kids had technically been sent to bed (even though I got a reminder email a couple days ago and it's been on the calendar for weeks) but when I reminded Rachel about her talk she immediately bounded out of bed, found a pencil and paper, and got to work while I was stuck in Benjamin's room singing lullabies. Her topic is "The Sabbath Day is a Day of Rest and Worship." She got pretty far on her own. Using the creation story was her idea and she came up with the list of Sunday activities all by herself as well. After I'd put Benjamin to bed I helped her find a quote from The Friend Magazine (from 1975) to beef up her talk a bit (it was a tad short but she wasn't sure what else to say). Andrew pulled into the parking lot, threw the van into park, and let his shaking hands slide from the wheel. He was white as a ghost and looked about like he was going to throw up. Instead he started to cry. I reached over and turned off the car. "You did a good job," I said, stroking his cold, clammy arm. He nodded and took a shuddering breath. "We should say a prayer," I said. The kids immediately folded their arms and I said a prayer of gratitude, thanking Heavenly Father for sparing our lives, for keeping Andrew alert, for moving us out of harm's way. "Can we go play now?" the girls asked. "We'll take Benjamin with us," Rachel volunteered (as bait to eke out a yes from me). The girls unbuckled their brother and the three of them struck out for the playground where many of their friends were already playing. The ward Pig Pickin' was today. Even though it started much earlier in the morning we aimed to arrive around lunchtime. For some reason it feels weird to start an activity three hours before you eat when you're planning on staying a couple of hours after you eat. We left the house around 11:30 and headed down Guess Road toward Little River Regional Park. We drive that way a lot—the kids and I—we have friends who lives out there (we meet at their house for ukulele a couple times a month). I even drove out to Little River Park by myself once. It was my first time going 55 MPH and...it was rather scary. Even though I've had to go 55 MPH several times since that first time, I was more than happy to have Andrew drive today. It's funny to me when people ask if raising Benjamin—a boy—is different from raising "the girls," as if they're assuming Rachel and Miriam are personality clones. A boy certainly has presented different challenges, for example, when Benjamin decided he could go potty like a big boy the other day and dragged a stool over to the toilet so he could pee standing up. He peed everywhere. I never had that particular problem with either of the girls, but still raising Miriam has been quite different from raising Rachel. When people ask me that—if raising our boy is different from raising our girl—I try to explain that Rachel and Miriam are polar opposites, personality-wise, and that Benjamin fits somewhere in the middle. Rachel was a loud baby, a fit-thrower, and about as precocious as could be (fully crawling at five months old (when her peers were barely starting to roll over)). Miriam was a quiet baby, a self-soother, content to play in one spot (I thought she was developmentally delayed until I realized she was actually right on target). Benjamin can throw a good fit, but he also easier to comfort than Rachel ever was. He didn't crawl or walk particularly early, but he was rolling over before he'd even reached his due date (front to back and back to front—a skill probably attained, in part, to the gravitational pull of his huge head). Now Rachel is a self-proclaimed tom boy, a tree-climber, a soccer player. Miriam is a self-proclaimed girly-girl, a dancer, an artist. Benjamin is a toddler, still too young to tell exactly how his boyhood is going to be. All three children are different. "Mom," she said, "I need to get rid of this swim suit. It doesn't fit. I don't need it. Can I give it to Marcella? I just need to get it out of the way because I have a new bathing suit now. Can I put it in the give-away box? Where is the give-away box? I just need to get rid of this old bathing suit!" For Rachel it was a pair of purple clogs (not Crocs, but same idea) that she's been wearing almost everyday for the past year. The strap broke on our way up to Palmyra and Sister Kellis gave us some pretty duct tape (a floral pattern) to fix it with until we could find a replacement shoe for her to wear. Now she's developing a hole in the sole of one of the shoes. Besides which they're getting too small. We bought her a new pair of Crocs when they were on sale at Costco but she won't wear them. Not yet. "When these break for good," Rachel murmured solemnly (probably while caressing her shoes), "I'm going to take one of the heel straps and glue it into my journal so I can remember these shoes forever. I think I'll put the duct-taped strap in, so I will remember the very first time my shoes fell apart. But I'm going to keep wearing them until they completely wear out." So that's why I giggle a bit when people ask if raising Benjamin has been different from raising his sisters, because, frankly, raising his sisters has been two very different adventures. Instead of going to a soccer game, we went to the park. I think my two little ones found that just as much fun as going to a soccer game (if not more fun). 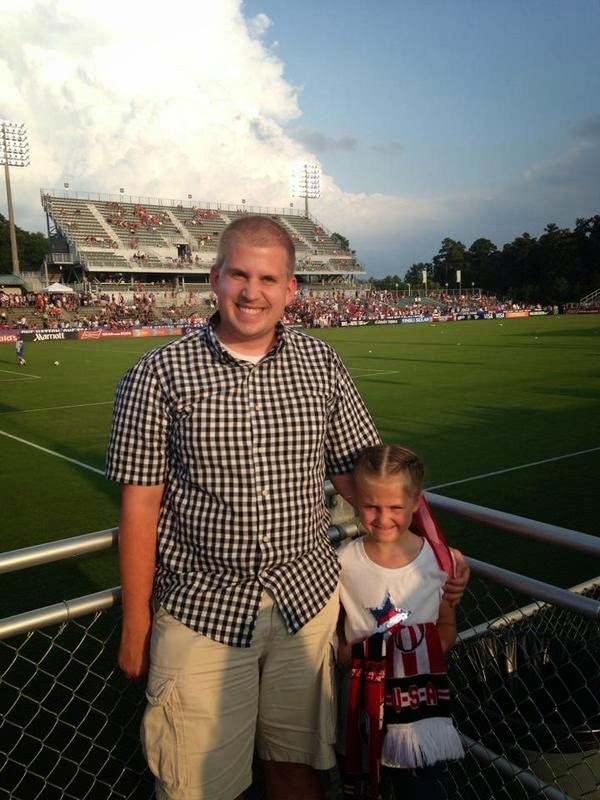 The US National Women's team played against Switzerland today in Cary and Andrew just couldn't resist taking his budding soccer player to the game. She has been counting down for a couple of weeks now and could hardly stand the excitement today. On Saturday I finally made the kids help me go through the catch-all toy box in the living room. Technically, nothing really belongs in that bin. It's there for quick clean ups only. Eventually, however, it gets filled to overflowing and we have to dump it out and put everything back in its proper home (blocks with the blocks, books with the books, LEGO with the LEGO, and so on). Benjamin was thrilled to find so many lost treasures. He popped a soother into his mouth (a soother that, for the record, I don't think any of my children have ever used), grabbed a toy cell phone, slapped a wood-bead bracelet on his wrist, walked over to me and mumbled around the soother, "Me—baby." Then he crawled onto my lap and insisted on laying down (like a baby) while "texting" on his phone. This morning Miriam went to her preschool's open house. She kept calling it the "open schoolhouse" because even though her preschool is in a house it's not just a house. It's a schoolhouse and a house. The kids have already spent some time at this house, playing with the little boys who live there, so Miriam was already familiar with the preschool room. Rachel was impressed by the idea of having a preschool in a home, run by a friend, though I'm not sure why because her preschool was...in a home, run by a friend. Anyway, the girls had both asked when Miriam would be able to attend preschool and our answer was that we didn't know because paying preschool tuition was a little out of our budget. When the girls came home from playing at this house, Rachel said, "Mom! You can just send Miriam to Sister Lewis's preschool! I'm sure she'll take Miriam as a student and I already checked out the classroom and it's awesome!" She was a little crushed when I told her that even Sister Lewis charges tuition so Miriam would be just fine learning at home. But then I found out that Sister Lewis trades preschool tuition for swimming lessons and babysitting and hair cuts. That is a currency I can work with! And thus began our summer of basically living at the pool. Seriously. Andrew and I are doing this "bike across America" challenge this year, only we're doing it on a stationary bike in our living room. He's done more than his share of the biking this summer (and he's been doing great because we're still on track to finish by the end of the year) which I almost felt guilty about until I realized that I took the kids swimming a bazillion times this summer. Then I decided that it was perfectly fair. Today was my first time in the preschool room, though I've been to Sister Lewis's house for book club and playgroup and other get-togethers like that. I have to agree with Rachel. It's a pretty neat school room (though it's probably not quite as neat as the school room that Rachel had for preschool—that was...wow). Miriam had to write her name on a strip of paper, and the numbers 1–10 on another. She also had to do a self portrait. These, I know, will go in her end-of-year book (along with the same snippets from around the middle of the year and at the end of the year). I know this because my friend Laura's son showed me his book at the end of last school year. I finished reading Jesus the Christ yesterday and today I started reading Authoring the Old Testament:Genesis–Deuteronomy by David Bokovoy (a friend from high school's brother-in-law) and it was like a breath of fresh air. Jesus the Christ was great, but it was just so long...and erudite...and published 100 years ago. I'm only partway into chapter one of Authoring the Old Testament and already I can tell it's going to be a more enjoyable read (and not only because the footnotes and endnotes won't drive me crazy the entire time). Bokovoy wanted his book to read like a detective novel, and it's been captivating thus far. And I've already been able to relate to it quite a bit. In fact, I was relating to it on the acknowledgements page. Seriously—I was on page xiii and already I was nodding my head in agreement while my soul simultaneously shrank at the very thought of what we're about to embark on in the coming years. This is the part that spoke to me: "In my mind, however, I wasn't convinced that now was the right time to undertake such a project [writing this book]. I had a very heavy teaching load and my family was still recovering from my dissertation." Graduate school is hard. I'm not even in graduate school and it's hard. It's one o'clock in the morning and I'm authoring my third blog post for the day (night? morning?). Why? Because my husband, who took an entire 50 minutes off to eat dinner with us and to have family scripture study before bed, is busy working away in our bedroom his office. Still. This is not unusual for us/him. Miriam has been growing like a weed this summer! In May when we first pulled out the swim stuff we tried on all sorts of bathing suits to see what fit who. Rachel had outgrown hers from last summer but Miriam's still fit. Soon she stopped wearing that one in favour of others. "It's getting too small," she explained. This afternoon she was tugging and tugging at a bathing suit, trying to squash herself inside it. "Why don't you try this one on?" I asked, digging out the swimsuit Grandma had sent for Rachel last summer (but which was too small for Rachel then). Miriam had tried it on in May and it hadn't fit her then so she wasn't too sure about trying it on now. I convinced her to though and she found, much to her delight, that it fit quite well. She was excited to wear it to the pool this afternoon. ...I believe—though I'm not certain—that it's this dinosaur. Miriam went into Teach Your Child to Read in 100 Easy Lessons knowing her letters and their coordinating sounds, thanks in large part to a song that Rachel learned in preschool and that we now sing all the time in our house. My girls know this song forwards and backwards and in sign language as well. Benjamin knows it a little less well but loves it. I think he alone accounts for at least a thousand of the 250,000,000 views. When we sing it—and we're not trying to do the sign language for it—we throw in whatever words we can think of that start with any given letter (we don't do the sign language when we do it this way because our vocabulary isn't big enough to sign whatever our hearts desire). Between this song and Letter Factory, my kids have phonics down pat by the time they want to learn how to read, so I have to admit that the first few lessons are rather boring. Rachel refused to do them at all. We'd fight and fight and fight our way through them until I decided the fight wasn't worth it. No more reading lessons for Rachel. I still read to her everyday. I simply stopped trying to make her read, which is weird because she wanted to learn. She wanted to learn but refused to be taught. So, we just read every day. Rachel has always been a lover of stories. She requested stories all day long. "Tell me a story. Tell me another story. What else about this? What else about that?" In fact, she's hardly ever played with toys because all she wants is a good story. Playing with toys has never been something she's found very fulfilling. She once had to write a story (in kindergarten) about her favourite toy. She wrote about her pink blanket. "My favourite toy is my pink blanket..." she wrote. Rachel walked out of her bedroom a couple of days ago with a list of all the volcanoes in Mongolia. There are five: Bus-Obo, Dariganga, Khanuy Gol, Middle Gobi, Taryatu-Chulutu. "I just had to write these down," she said. "So I wouldn't forget. I just have one question." I pulled up a map and we found Mongolia, snuggly nestled between Russia and China. Then she ran back to her room to pick her book up again. She's been reading the Children of the Lamp series by P.B. Kerr and she's been loving it. Tonight she walked out of her bedroom with tears in her eyes. She pointed to the very last words on the page and blubbered, "It says 'the end,' Mom! Why did you make me finish it tonight? I could have finished it tomorrow!" She had seven pages left in the book and wanted to start reading Ella Enchanted again but I told her to just finish with The Grave Robbers of Genghis Khan first because it's a library book and has to go back soon. And apparently that makes me a meanie because the series is over. "It's the end of the book," I pointed out. "Of course it says 'the end.'" "No," Rachel lamented. "None of the other books said 'the end.' This is it. There aren't any more Children of the Lamp books. I want more Children of the Lamp books! It isn't fair!" I think I'm going to call it: Benjamin is officially potty trained. Lest I be accused of gloating, I think now's as good at time as any to mention that although he's officially potty trained he also peed on me during scripture study tonight. Benjamin has been (mostly) accident-free for several days in a row. Maybe even weeks. We can even send him to nursery in underwear and he does just fine (though when Andrew picked him up on Sunday he had clearly been waiting to go for far too long and started crying, "Potty! Potty! Potty!" the minute he saw Daddy). We're working on staying dry through the night, though I'm not sure that's going terribly well. I wake him up to go potty every night before we go to bed and about 50% of the time he'll have already wet the bed. But, on the whole, I'd say he's potty trained and I'm quite happy about that because changing diapers is not my favourite thing to do. All my cloth diapers have been packed away in a box, along with my nursing covers and baby carriers. While I'm happy to retire them for a season, deep down inside (and rather close to the surface as well) I'm hoping to pull them out again sooner rather than later. We've been working on sleep training again as well. I've enjoyed all the reading time I've gotten while waiting for Benjamin to fall asleep but I sure am glad that I was able to put him to bed easily tonight. I just put him into his bed, and then put him into his bed again, and then put him into his bed again, and then he fell asleep. Third time's the charm! It might have helped that he didn't take a nap today because it was an early release day and Rachel came home from school around the same time Benjamin usually goes down for his afternoon nap. And then, of course, everyone wanted to go to the pool. Saying no to the pool is very hard to do when it's as gloriously sunny outside as it was today (the clouds decided to give us a break). Rachel's in school all day long while everyone else is still on summer break so when she has an afternoon free I can't really say no. I just can't. So off to the pool we went, nap time be...forgotten. We stayed at the pool for three hours. A fun time was had by all. Yesterday morning I printed out some circles to fit in our strip word chart. Miriam and I coloured them to match our handbell set and then we arranged them in the chart to help Miriam play Twinkle, Twinkle, Little Star. It was quite a long process but we got it all figured out in the end and Miriam enjoyed playing her handbells. Yesterday morning we found a luna moth perched on our front porch. It was beautiful, and large! My hand is in the picture for size reference. It's bent all awkwardly because I'm squatting on the railing and bending my arm backwards over that little ledge thing. It was not the most comfortable position. The moth was still there when we got home from church but this morning it was gone. As big as the luna moth was, I'm not sure it was any bigger than the imperial moth we found at the pool on Thursday (it was there on the gate when we went to the pool at 10 AM and it was still there on the gate when we left the pool (for the last time) at 6 PM). The luna moth was, however, much prettier! Benjamin didn't wear shoes to church today. I did a lot of talking about finding shoes for him but I think it was a case of having too many cooks in the kitchen and nobody ended up helping Benjamin with his shoes. He left the house and climbed into the van with his sisters. Rachel dutifully buckled him in. Andrew and I finished grabbing all the last minute things (church bag, lesson manuals, house keys, etc.) and headed out the door so we'd be on time to pick up a friend who needed a ride so we'd be on time for church. When we got to church I noticed that Benjamin had bare feet. "Where are your shoes, buddy?" I asked. Benjamin just shrugged his shoulders so I kept hunting around the van for them. He's in the habit of taking off his shoes and chucking them as far as he can away from himself. My search yielded nothing. "Who put shoes on Benjamin this morning?" I asked. "Did anyone put shoes on Benjamin?" Everyone eyeballed everyone else with curious looks on their faces. "No one put shoes on Benjamin. How did he get out to the car?" I asked. "Why would he be in the car without his shoes?" "He walked out by himself," I was told by the girls. "He just followed us out." "Who buckled him in?" I asked. "I did," Rachel said, "But I didn't check his feet." To be fair I had checked to make sure his buckle was secure, but I didn't check his feet shoes either. So Benjamin went to church without shoes and he was not bothered one little bit. Once in the chapel, Andrew set about arranging a ride home for the friend we gave a ride to this morning. We stay for choir, this friend doesn't. For some reason Andrew asked the executive secretary if he could give out friend a ride home. The executive secretary is responsible for many things—one of his duties (at least in our ward—is it the same everywhere? I don't know) is asking people to say the invocation and benediction. "Oh, sure, I can give him a ride," the secretary teased, "But only if you'll say the opening prayer." Miriam had love. She gav[e] it to Mommy, she gav[e] it to Daddy, and she gav[e] it to Benjamin and Rachel and Grandma, to[o], and Grandpa, to[o]. It was fun when Miriam giv[e]s her love with efrewan [everyone]. And she giv[e]s her love to Lily. The end. 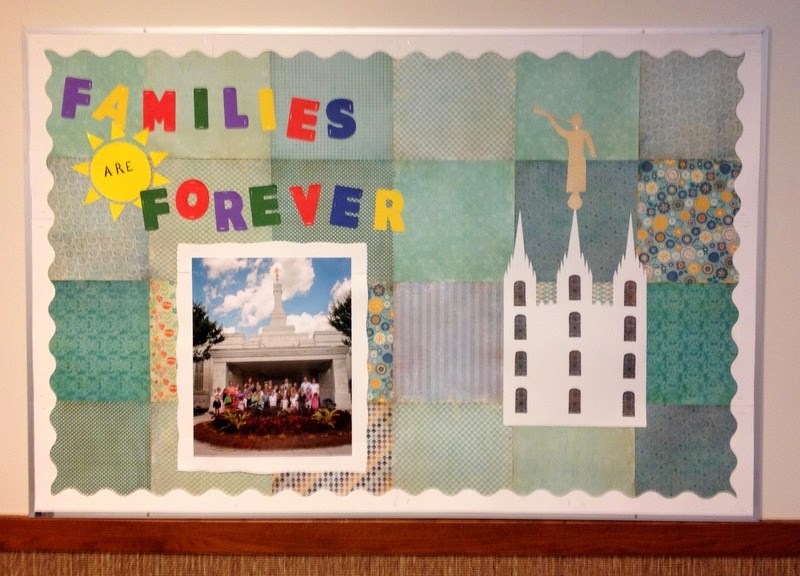 Last month, right before we were released from primary, Marian and I spent a couple hours at the church putting a bulletin board together to better display the annual theme for primary (something we should have done in, oh, January). Our previous board was from a sharing time lesson we did in November and sadly proclaimed, "I AM HANKFUL" (because someone had pulled off the T in thankful). Our bulletin board was in desperate need of a makeover, so even though we knew we wouldn't be around to enjoy the fruits of our labour, we put a little something together anyway. I think it turned out nicely considering we went into the project without a solid idea of how we wanted it to turn out.